Christmas and Holiday Articles - PLR Pack 1: Stress Less! Hey, guys! This is Dina from Wordfeeder PLR. I've got a mini pack of Christmas/Holiday PLR articles to make your blogging and online moneymaking tasks easy peasy this busy holiday season. Plus, in addition to the articles included in this Christmas set, I've also added several brand new "holiday stress" themed articles to the checkout page that opens up when you click buy now, below. 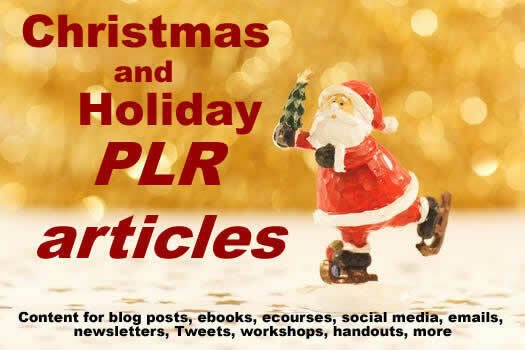 What's Included in This Christmas and Holiday PLR Article Mini Pack? This content pack includes 4 articles and a total of 2,399 words. Deliverable is an MS Word document that you'll receive via email after your online order processes. You'll also get free access to the many high quality content packs available on the Wordfeeder PLR website. This includes breastfeeding Q&A Content, Essential Oils Q&A content, cell phone etiquette articles, home and family articles, articles about publishing articles in order to sell things, and much more. ALL of this content, including the articles from this holiday pack, will be accessible any time from your member account each time you log in. Okay, that sounds pretty good. So what's in this Christmas article PLR pack, then? Here's a list of included titles. Again, word count is 2,399. 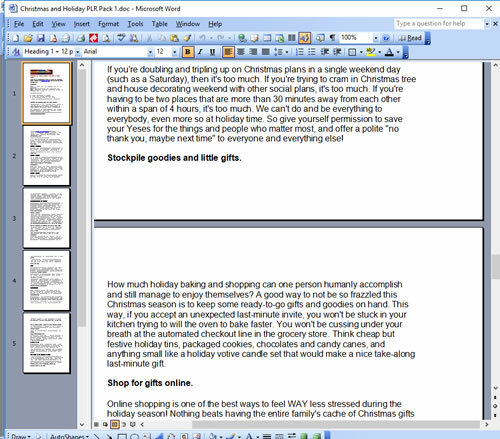 I'm planning on creating even more holiday article PLR packs. So if you're game for that, order your articles today and I'll let you know when the next pack is ready. PLEASE NOTE! I've added some awesome new Holiday Stress articles to the Wordfeeder site for holidays 2018. You still have plenty of time to set them up and publish as a blog, sell or give away in mini ebook form, or send out via email. The new articles can be found "ala carte" for a dollar or two each right in the checkout area after you click "buy now." Click now to explore the newly added titles and order!